Product Dimensions: A4; laminated front and back covers, wire ring bound. 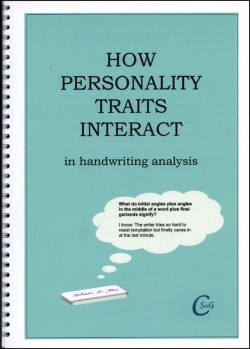 This book brings the different graphological schools of thought together in one volume. First of all it outlines the general or holistic signs and shows how these signs can be combined together to produce a resultant. It follows on to discuss the dominants and counter-dominants in handwriting and shows how these can be used in compilations. A table of the trait stroke school’s particular signs are displayed pictorially. Some of the general signs are then aligned to particular traits to create new meanings and personality characteristics. Finally, in a comprehensive list of trait combinations (placed in alphabetical categories), simple to multiple trait clusters are brought together with their resultant descriptions. This book is must for those who find the combination of traits a difficult exercise. Product Dimensions: A4; laminated covers; plastic comb bound. Price: £12.00 (plus £3.50 post and packaging in UK, £12 p & p overseas) or £12 for pdf version. 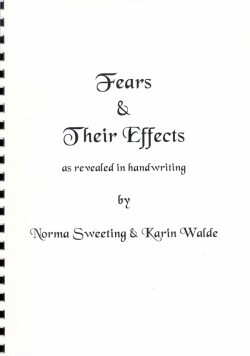 This book describes the individual fears shown in handwriting such as “Guilt, Jealousy, Indecision, Self Consciousness, Timidity” etc and then looks at the various defence mechanisms used to deal with them. It comes complete with illustrations.